You've heard all the warnings and studies about how you shouldn't drink so many sodas. 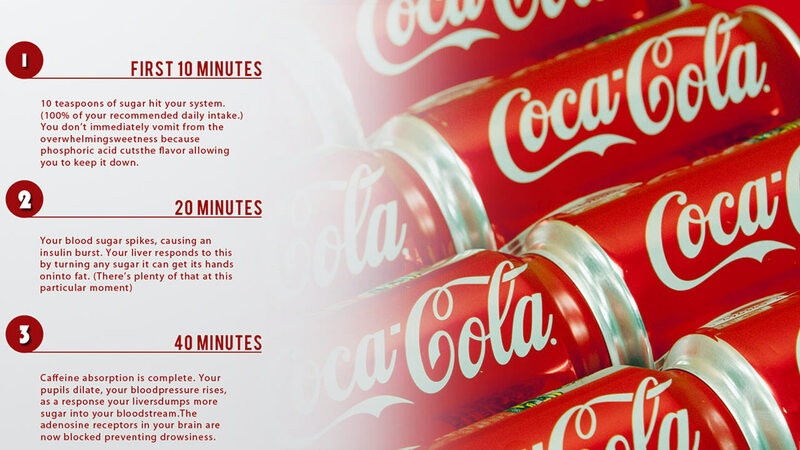 Now, a new infographic might make you rethink those sugary soft drink. 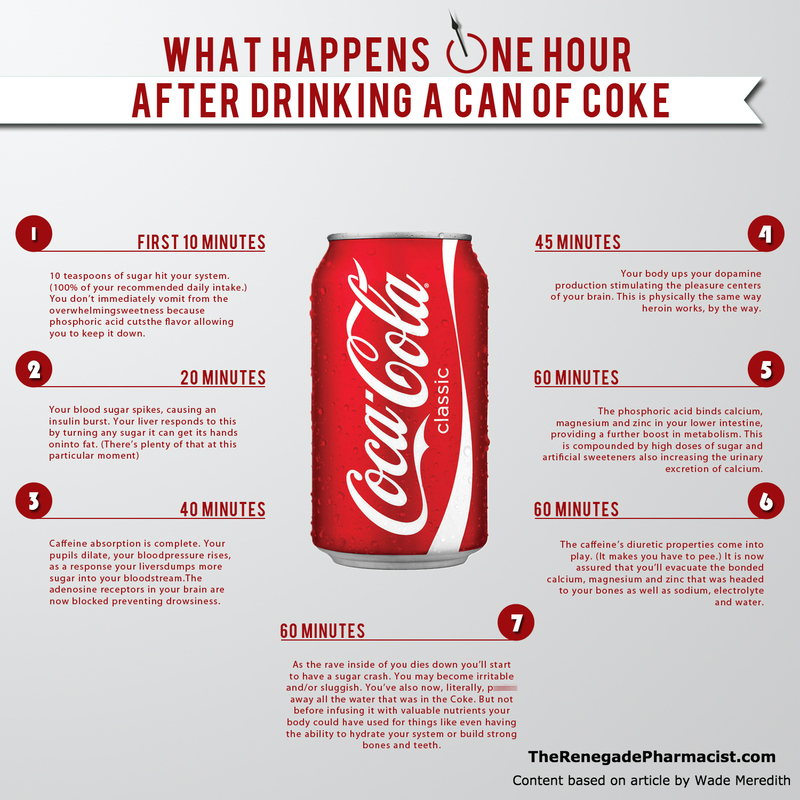 It claims to show exactly what happens inside your body in the hour after you finish off a 12-ounce can of fully caffeinated, fully sugared cola. In the first 10 minutes, your body will have taken in 100% of your recommended daily intake of sugar. That's a whole 10 teaspoons worth. Twenty minutes after your final sip, your blood sugar spikes. Your liver then fights back by turning that excess sugar into fat. After 45 minutes, your body finishes absorbing all the caffeine and your body increases its dopamine production. The effect is similar to how heroin works on the pleasure centers of your brain. A full hour after finishing your drink, the diuretic properties of the caffeine come into play. They cause you to use the restroom, and in turn flush away calcium, magnesium and zinc your body needs. The dopamine production also comes to a halt, leading to a sugar crash which can cause you to become irritable and sluggish. But the science of the infographic may be over-exaggerated, according to Buzzfeed News. It reached out to Kimber Stanhope, Ph.D., RD, an associate research nutritional biologist for the University of California Davis department of molecular biosciences, to clarify some of the soda science. Stanhope says many of the claims about the effect of caffeine on your body are "way overblown, as such things tend to be," saying the average Coke drinker can easily handle the dose found in a 12-ounce drink. The same goes for the claims about the impact sugar intake has on your body. The Renegade Pharmacist responded saying he uses the chart mainly to encourage others to swap sodas for something healthier. "Replacing fizzy drinks with water with fresh lemon or lime juice can have a dramatic effect on their health," he said via an email. "This indicated to me that fizzy drinks and sugar were big issues relating to blood pressure and metabolic diseases like diabetes and heart disease." There have been numerous health studies over the years on the impact soda has on your health. Some studies have shown that its consumption is linked with tooth decay and diabetes, and it also seems to be bad for your bones, reports ABC News. Coca-Cola, in response to these studies, began addressing obesity for the first time in a TV ad in 2013. That ad included a voiceover stating that weight gain is the result of consuming too many calories of any kind, not just soda. Then in 2014, Coke released an online ad where it tried to show how fun it could be to burn off the 140 calories in a can of its soda. The ad, which notes that it typically takes 23 minutes of cycling to achieve that, shows a montage of people on a giant stationary bicycle happily trying to earn a can of its cola, with carnival music playing in the background. At the end of the video, which runs for 1 minute and 40 seconds, the phrase "Movement is happiness" appears on the screen, followed by: "Where will happiness strike next?"